100% cotton HARVARD hat. 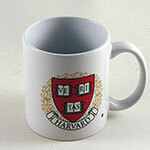 The word "HARVARD" is in large, 1 inch embossed raised letters. Below HARVARD is the year “1636”, when Harvard was founded. “UNIVERSITY” is just below 1636. 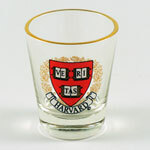 On the back is the embossed Harvard "H". Cap has pre-curved bill, cloth strap and an antique brass slide buckle closure with tuck-in grommet, so it fits well on anyone. 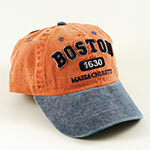 Nantucket red with contrasting navy bill. Soft, durable, and color-fast. Officially licensed by Harvard University.